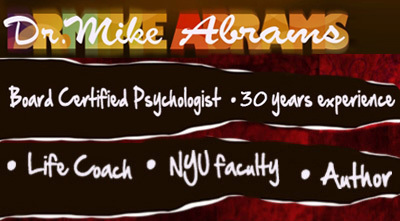 Dr. Mike Abrams' approaches life problems by continually listening for client beliefs that lead to emotional distress. This humanistic technique is applicable to social, interpersonal, family, and sexual problems. He is among the few psychologists in New York City Board who is Certified in these methods. Below are some of the core beliefs that cause emotional disturbance. 1. I need love and approval from those significant to me - and I must avoid disapproval from any source. 1. Love and approval are good things to have, and I'll seek them when I can. But they are not necessities - I can survive (even though uncomfortably) without them. 2. To be worthwhile as a person I must achieve, succeed at what ever I do, and make no mistakes. 2. I'll always seek to achieve as much as I can - but unfailing success and competence is unrealistic. Better I just accept myself as a person, separate to my performance. 3. People should always do the right thing. bad things. But humans are not yet perfect - and upsetting myself won't change that reality. 4. Things must be the way I want them to be - otherwise life will be intolerable. 4. There is no law which says that things have to be the way I want. It's disappointing, but I can stand it - especially if I avoid catastrophising. 5. My unhappiness is caused by things outside my control - so there is little I can do to feel any better. 5. Many external factors are outside my control. But it is my thoughts (not the externals) which cause my feelings. And I can learn to control my thoughts. 6. I must worry about things that could be dangerous, unpleasant or frightening - otherwise they might happen. 6. Worrying about things that might go wrong won't stop them happening. It will, though, ensure I get upset and disturbed right now! 7. I can be happier by avoiding life's difficulties, unpleasantness, and responsibilities. 7. Avoiding problems is only easier in the short term - putting things off can mak them worse later on. It also gives me more time to worry about them! 8. Relying on someone else can lead to dependent behavior. It is OK to seek help - as long as I learn to trust myself and my own judgment. 9. Events in my past are the cause of my problems - and they continue to influence my feelings and behaviors now. 9. The past can't influence me now. My current beliefs cause my reactions. I may have learned these beliefs in the past, but can choose to analyze and change them in the present. 10. I should become upset when other people have problems and feel unhappy when they're sad. 10. I can't change other people's problems and bad feelings by getting myself upset. 11. I should not have to feel discomfort and pain - I can't stand them and must avoid them at all costs. 12. Every problem should have an ideal solution, and it is intolerable when one can't be found. 12. Problems usually have many possible solutions. It is better to stop waiting for the perfect one and get on with the best available. I can live with less than the ideal. when they �know� that they are behaving poorly. � instead of the idea that the so-called easy way is usually much harder in the long run. treatments for stress-related disorders are detailed and explained. bad. Yerkes & Dodson demonstrated this over a generation ago. arousal in one set of individuals and virtually no reaction in others. stressful or assuaging but thinking makes it so (Ellis & Abrahms, 1978). al., 1989, 1990; Ellis, 1993). (Larbig, 1978; Woods & Lyons, 1990; Hart et al., 1991). continued arousal, the weakest systems in the body begin to break down. or the superego) taking direct action or direct control of behaviour. so. In most cases, he or she will. to do what they do so well (Nisbett & Wilson, 1977). any organic basis for his symptoms. pleased, and never accepted his authority as `the man' of the household. relieved him of, the pain of his apparently inescapable dilemma. a way out of his circumstances could be found. him and because he could no longer tolerate her. disputing that challenges their irrational disturbance-creating beliefs. 1978, 1985a, 1988, 1991; Ellis & Dryden, 1987). cognitive changes that can bring them under control. REBT that most tests the skill of the therapist. the therapist had better accept this as the starting point. dispute (D) these beliefs (B). many unfortunate hassles because that is the nature of normal living. nutty head! I won't die of them and can be happy in spite of them. themselves after other individuals who have coped well with stressors. interfering with their taking stressors too seriously (Ellis, 1987). with assertion, communication, relationship, and social skills training. inevitable; undue stress about them is not. knowing that, Science, 210, pp. 207-210.
theories: toward a conceptual integration, Lifestyles, 12, pp. 361-377.
and Implications of Research (New York, Springer). (cassette recording), Institute for Rational-Emotive Therapy, New York. Meditation, pp. 671-673 (New York, Aldine). Difficult Clients (New York, Springer). Studies in Hypnotherapy, pp. 1-11 (New York, Guilford Press). About Anything Yes, Anything (Secaucus, NJ, Lyle Stuart). Journal of Rational-Emotive and Cognitive Behavior Therapy, 9, pp. Rational-Emotive and Cognitive Behavior Therapy (in press). stress management, School Psychology Review, 19, pp. 315-321. Rational-Emotive Therapy, 5, pp. 255-265. Quarterly Journal of Experimental Psychology, 30, pp. 282-295.
ii. applications, Biofeedback and Self Regulation, 15, pp. 171-177. Cognitive Psychotherapy: an International Quarterly, 3, pp. 5-14.
the role of current stress, Behaviour Research and Therapy, 26, pp. Personality and Individual Differences, 12, pp. 557-560. HENRY, B.M., GONZALEZ DE RTVERA, J.L. & DE LAS CUEVAS, C. & GONZALEZ, I.
Psiquis: Revista de Psiquiatria, Psicologia y Psicosomatica, 12, pp. phobias, Psychological Review, 92, pp. 512-531. Psychology: General, 110, pp. 306 340. Canadian fournal of Psychology, 32, pp. 300-324.
stimuli that cannot be recognized, Science, 207, pp. 557-558. Medizin und Psychoanalyse, 24, pp. 355-367.
application, American Journal of Psychiatry, 145, pp. 1358-1368. (Ed.) Personality and Behavior Disorders (New York, Ronald Press). verbal reports on mental processes, Psychological Review, 84, pp. Cognition: the Loyola Symposium (Hillsdale, NJ, Erlbaum). Experimental Psychology: General, 118, pp. 219-235.
modality, Memory and Cognition, 7, pp. 3-12.
hypnotic induction), Expenmentelle und Klinische Hypnose, 5, pp. 83-90. Journal of Personality, 55, pp. 155-167.
research findings, Comprehensive Psychiatry, 15, pp. 285-294.
stressful life events, Journal of Rational-Emotive Therapy, 5, pp. diagnosis, and normal subjects, Behaviour Research and Therapy, 28, pp.